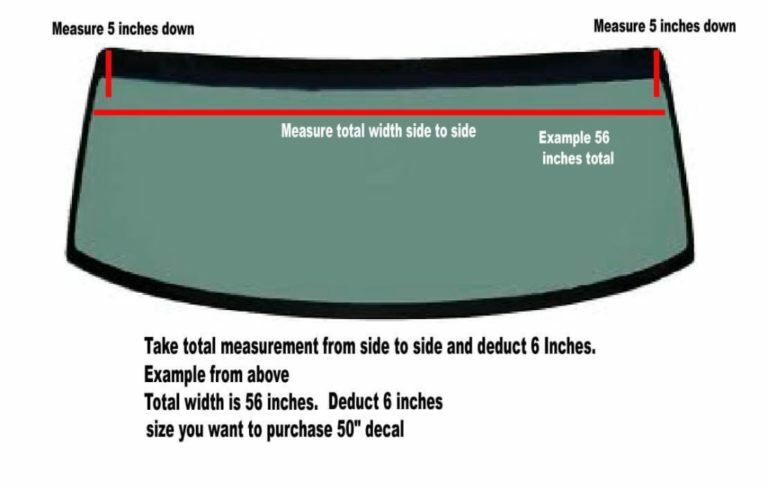 Please use the following guide to measure your windshield so the correct size is ordered. Step 1. Measure 5 inches down from the top on either side and make a mark with a piece of tape or a dry erase marker. Step 2. Measure across the windshield from mark to mark. This is your overall length. Step 3. Deduct 6 inches from the total from step 2. The total from Step 3 is the Width of the space you have to install your decal. You can now order any size decal up to this total width. Using the Picture Reference the MAX width you can order is 50 inches Wide.